According to the American Psychological Association, people who identify as LGBT utilize mental health services more than their heterosexual counterparts. They also experience depression, anxiety, substance abuse and suicidality at disproportionate rates, and are more likely to be homeless, suffer abuse and experience feelings of loneliness. Forty-two percent of LGBT youth say their communities are not accepting of LGBT populations. In recent years, mental health professionals have tackled these trends by implementing training programs so they can better serve LGBT youth and adults. 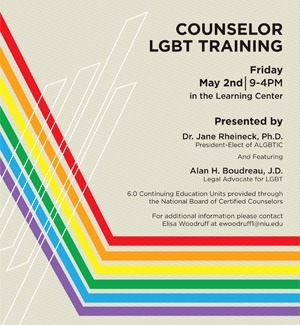 From 9 a.m. to 4 p.m. Friday, May 2, the NIU Counseling Association and Chi Sigma Iota will build on the profession’s efforts to better serve LGBT clients by offering a workshop titled “Counselor LGBT Training” in the Gabel Hall Learning Center. Two nationally recognized leaders in the field of LGBT studies will serve as the keynote presenters. Jane Rheineck will start the morning by teaching counselors the develop the knowledge, awareness and skills necessary to make their practice LGBT-affirming. In the afternoon, Alan H. Boudreau will speak on the legal issues facing LGBT clients, particularly those regarding marriage law and the ever-evolving diversity of family units, and how counselors can better advocate for their clients. The workshop is free and open to all, but it will be especially useful to those who are counselors, psychologists, social workers and others in the mental health profession. Registration is available online. Rheineck is an associate professor in NIU’s counseling program and president-elect of the national organization, the Association for LGBT Issues in Counseling. At NIU since 2007, she has taught a wide spectrum of courses including orientation to the counseling profession, counseling practicum and internship, counseling women and counseling lesbian, gay, bisexual and transgendered individuals. Her research and publications have focused on women’s career development, the implications of counseling lesbian and gay individuals and working with youth at risk. As a licensed clinical professional counselor in Illinois, her counseling experience reflects a broad range of experiences that include adolescent inpatient residential treatment, outpatient counseling with adults and mental health counseling in the schools. 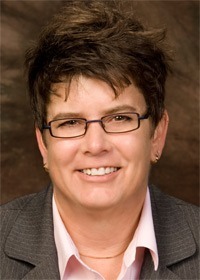 Boudreau is a visiting clinical professor at NIU’s College of Law and serves on the board of directors of the National LGBT Bar Association. 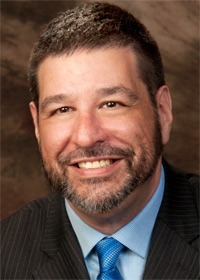 Prior to coming to NIU, he was an attorney and mediator in private practice focused on alternative dispute resolution, family law, residential real estate and estate planning. He serves as a volunteer mediator and trainer with the Center for Conflict Resolution and acts as an arbitrator for the Cook County Mandatory Arbitration program. “As today’s families grow more diverse, members of the helping professions are constantly challenged to provide outstanding service in unfamiliar situations. One challenge for professionals is working with members of the LGBTQ community, whose family structures and legal status are evolving rapidly,” Boudreau said. Six Continuing Education Units will be provided through the National Board of Certified Counselors. The Northern Illinois University counseling program is an NBCC-Approved Continuing Education Provider (ACEP) and can offer NBCC-approved clock hours for events that meet NBCC requirements. The ACEP solely is responsible for all aspects of the program. For more information, email elisa.woodruff@gmail.com.